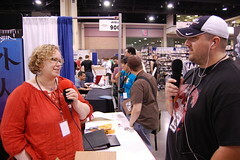 She was our first interview at HeroesCon 2007, and we wanted to make her our first interview at HeroesCon 2008 as well. And we did just that…sort of. Brian’s lack of technical savvy cost he and Kris a great interview with our favorite colorist Laura Martin on Friday, But the newest member of Gaijin Studio, is as nice as she is talented and she gave Brian and Adam another shot on Sunday. Listen in as we discuss her work on Thor, Secret Invasion, Astonishing X-Men and more on this interview edition of the Dollar Bin.